The snow last weekend that just barely touched us in Baltimore but devastated the New England region was the best and most timely contradiction for me in all ways. Yesterday, over at Maryland Voices, our True Tuesdays prompt focused on Contradiction and the opportunities we are suddenly presented when such situations arise. What do you do when something goes against your routine, defies your everyday expectation? The contrast existing between the old and brilliant autumnal leaves against the virgin white snow allowed me to get off this annual surge of creativity, just long enough to really appreciate what this time of year means to me. Historically, this has been my most creative period, whether that be with a camera or a pen in hand. The touch of golden melancholy is just strong enough within me to stir the muse in wondrous ways, and I almost always emerge in December with a batch of pre-polished creativity that was as intense as it was joyful to make. Seeing the reds and yellows sprinkled with white only strengthened that surge in me to write and create. But it was because I stopped and took the time to absorb it, let it play around inside a bit, work its most unusual magic in this most magical season. We need to do more of this, this slowing down and taking the time to absorb the existing beauty around us. Our trains move too fast through this life, a shortened ride for many it seems these days, and I can only beg you enough to realize the joys and pleasures that await simply by slowing down, even just a little. These contradictions in our lives allow us the chance to do exactly this. They are the hiccups that make us catch our breath, focus for a moment on something we did not expect, ponder a little color and splash of virgin white to spin the wheels in the other direction and make us see that we don’t need to wait until the end of the journey to realize glory and beauty. It’s here right now, all around us, all the time. First, that photo? Super gorgeous. And second, I wholeheartedly agree. The weather might be a little different for me, but I find the same thing happening in fall — I tend to drag through summer only to remember, hey! outdoors!, and get a second wind come fall. Thanks, Kim… I definitely went hunting for this shot on the way to my daughter’s farm. 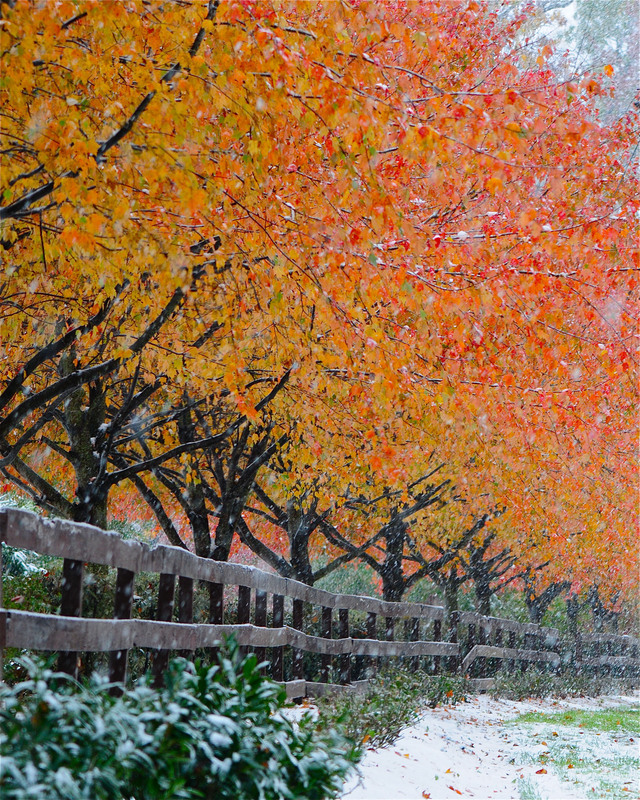 I was struck by the possibility of the stark contrast between the brilliant autumn colors and the white snow…. Thrilled that these Maples were at their peak. And…I have to remind myself all the time, too. The world is just too much with us…..